If you live anywhere near Chicago, no doubt you’ve seen the statues of two formidable lions guarding the entrance to the Art Institute. But what you may not have noticed – or maybe you saw it, but didn’t know quite what to make of it – is another art installation of sorts, less than 300 feet from those famous lions. Cecil Locke is the owner, founder and creator of the iconic ‘Touch and Go Chess Party” at the northeast corner of Jackson and Michigan Avenue. This colorful one-of-a-kind display is basically a 26-foot-long outdoor chess and checkers table with Whirlygigs and teddy bears above, that spin and bob in the wind. The space above the table is important to Locke. Tourists from all over the world, and locals too, take pictures of his creation, and he doesn’t want “negative space” above his chess display. He wants the photographs to be filled from top to bottom with beautiful objects and bright, happy colors like pink and yellow. 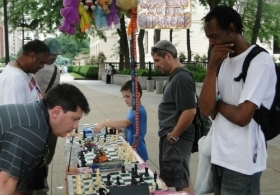 Locke studied art at Kennedy-King College and he describes his installation as a look at chess “through the eyes of an artist.” His street performer’s license allows him, in a sense, to perform chess in a public place, and others can join in if they want to. The demographic results of Cecil Locke’s experiment are impressive. There’s a steady stream of complete strangers who play chess together: Middle-aged men and women, young people, Asians, blacks, whites, Latinos. All this in a city that’s notoriously segregated. If players turn out to be at the same level sometimes “they’ll exchange phone numbers,” Locke said. “A lot of friendships start at my table here." Maybe some sociology professor should come study this place to figure out why playing chess in a public arena under the sun and the stars can help break down some of our most persistent social barriers. I’m not a chess player, but apparently that has a wide social appeal. I first visited the ‘Touch and Go Chess Party’ at about 9 p.m. on a recent Thursday night. That’s when I met Pam Butters of LaGrange, who’d brought her 7- and 9-year-old boys downtown earlier that day. Jeffrey Arndt and James Joseph were also there that night. They’re both “regulars” here and their game of choice is “speed chess” with countdown clocks and bouts that last only five minutes. Joseph is an attorney who specializes in commercial litigation and he works just across the street. It’s pushing 10 p.m. and Locke informs his patrons that he’ll be wrapping things up sometime soon. It’s been a long day. But then most are. Locke usually sets up around noon to catch office workers on their lunch break —and breaks the table down around 10 p.m. Weather permitting, he's there six days a week, Tuesday through Sunday. Except for the winter months when he creates posters, banners and signage for a variety of customers. It takes almost an hour and a half to pack up this table — which in a clever design that Locke’s justifiably proud of — folds down to a sixth of its size and rolls on four sturdy wheels. If that isn’t exhausting enough, Locke then has to make his trek home to Back of the Yards via the CTA. I ask how much Locke earns for all this hard work but he says that’s private. Fair enough. It felt kind of rude to ask, but you’re supposed to do that kind of thing when you’re “reporting.” I got a little worried though when I found out that Locke recommends a donation of $2 dollars for checkers. To play all day. “That is very reasonable,” I tell him. My tone of voice must reveal that I think it’s way tooreasonable. Not nearly enough, in my estimation, for time spent at one of the more pleasant destinations in Chicago. On Mondays, his day off, Locke sometimes goes to the library to peruse the Internet for pictures of his table. “Mostly I find pictures on Google, Flickr, MySpace and Yahoo,” he tells me. He’s found pictures of his table going back to 2004. Since December of 2012 he’s found about 1,150 pictures. “Yeah, people love it. So I’m getting free publicity for my table on the Internet,” he said. And sometimes those very cops bring their families down for some chess on their day off, Locke said. But mostly Locke carries the pictures because he likes them. “When I get old, I’m going to look at these pictures and say – ‘Oh! 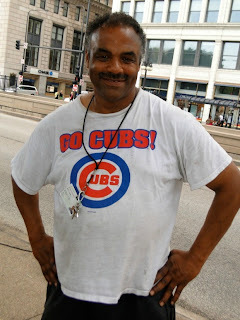 I remember that day.’ It chronicles my time on Michigan Avenue," he said.